You'll be £10.00 closer to your next £10.00 credit when you purchase Captured at Arnhem. What's this? Tom volunteered for war service in 1939 and was initially placed in the military railway of the Royal Engineers. In search of adventure, he successfully applied to join the newly formed 1st Parachute Squadron of the Royal Engineers. The intensity and rigours of parachute training are described in detail, as are the comradeship and humour that came to the fore as this small 150-man unit fought throughout the Second World War as part of the 1st Parachute Brigade. The excitement of the first parachute jumps are relived together with the parachute operations in North Africa, Sicily and the Battle of Arnhem. It was here after nine days' fighting with his mates falling around him that Tom was wounded and taken prisoner. Following the battle, Tom was transported in a cattle truck to Germany where he was used as forced labour in a lead mine until being liberated by the Americans in 1945. With insightful commentary from Tom's son Norman, this is the story of an ordinary soldier, who was motivated by pride in his unit. It was this that would not let him leave the army when he was twice given the opportunity to return home to support the struggling railway system. Tom has recounted his experiences with a keen eye and the sense of humour that has always enabled him to triumph in the face of adversity. Wounded and taken prisoner at Arnhem, Hicks spent the remainder of the war at a German lead mine; an exhausting and dangerous job, and certainly one of the least appealing places to which a POW could be sent to work. Here his narrative changes from a recollection of events years later to quoting verbatim from the almost daily diary which he kept almost from the moment of his capture until his arrival back in the UK in April 1945. This is a fascinating memoir giving a fresh picture of life in the Parachute Regiment. A very personal account of life on the railways and in Britain's 1st Airborne Division. Worth reading. Recommended to anybody with an interest in military history, airborne operations or just an appetite for a great story. The memoirs of the battle of Arnhem of Sapper Tom Hicks, who served in the 1st Parachute Squadron, are brought to life in a memoir written by his son Norman. The memoir, based on personal diaries and taped recollections, paints a dramatic picture of what it was like for thousands of young men who took part in the ill-fated attempt to capture the bridge across the River Rhine in 1944. You’d have thought from the title that this book was mainly about Operation Market Garden and its aftermath, however it is far more than that. This is the biography of Tom Hicks written by his son Norman. And very well written it is too. The book flows very well, is well explained throughout, I must admit whilst my knowledge of the military railway system was scant but has been improved by this book. The descriptions of Tom’s time in North Africa and Sicily give a good insight into the way the Sappers were deployed within the 1St Parachute Brigade and one can contrast it against the manner in which Operation Market Garden developed. A fascinating book telling the story of an unassuming individual who had an interesting wartime experience and has been lucky enough to have a son who has written it all down. The book is well illustrated with photos and maps throughout as well as a section of photos in the middle. There are plenty of footnotes, including some poignant ones describing the fate of many of Tom’s companions. There is also included as the final appendix, a Roll Of Honour of 1st Parachute Squadron, Royal Engineers. A fascinating story and an example of a person triumphing in the face of adversity through his sense of humour, keen eye, motivation and pride. 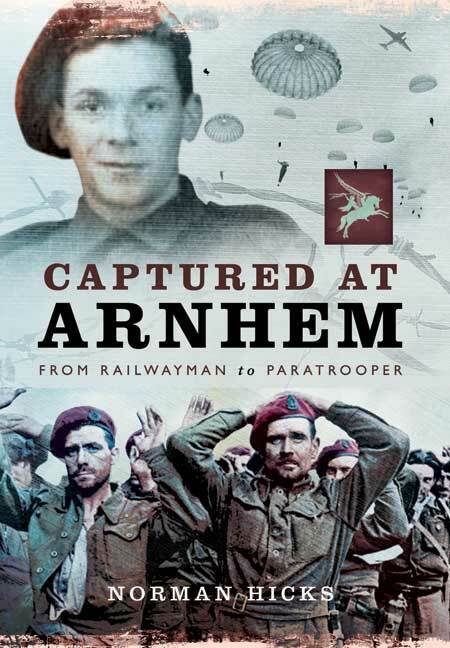 Captured at Arnhem by Norman Hicks is the story of Tom Hicks by his eldest son, on his war years and how he went from the railways to be a paratrooper and back again to working on the railways. It is always great to see that the stories of our old soldiers are being recorded so that in generations to come their story will live on long after we have all departed this mortal coil. This is an honest soldier’s account of his life and like many men of his age understated and just took it in their stride. Like many Tom Hicks did not come home to a great fanfare but now this book is his fanfare and it has been an honour and privilege to share in his story. The compelling tale of a soldier who was captured in Germany has been revealed in a new book written by his son, Norman Hicks, of Kinver. [Norman] provides insightful commentary as he tells the story of an ordinary soldier, motivated by pride in his unit to triumph in the face of adversity. Norman Hicks was born at Walton Hall near Wakefield Yorkshire in 1948. He left home in nearby Royston at the age of 16 to join the Royal Air Force as a boy apprentice in 1964. Qualifying as an operating Theatre Technician he served at home and abroad in Aden (South Arabia) 1967 and Cyprus 1970-73. Upon retirement, having an interest in both railways and the military he decided to write the biography of his father Tom.